I recently presented an overview of rug repair and examined a simple side cord repair. This time we will look at the most common repair your customer will need: end or fringe work. 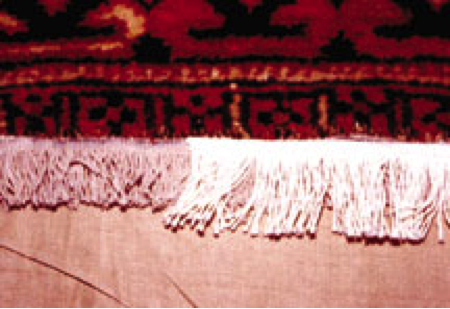 Oriental rugs are made with at least several wefts at the ends. These are essential to lock in the top and bottom rows of knots. 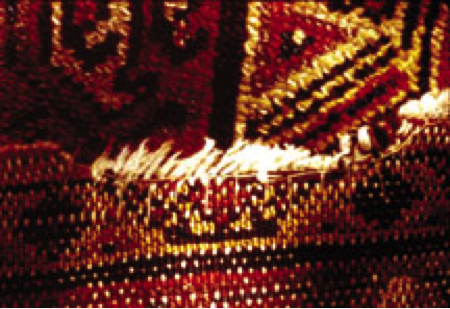 There are however many variations in the treatment of ends made by the weaver. Where a number of wefts and warps without pile are woven at the end of a rug, a strip of fabric is formed. This is referred to as the kelim or selvage (Image 1). There are a number of ways in which a fringe or kelim end can become damaged, but the most common is from foot traffic. 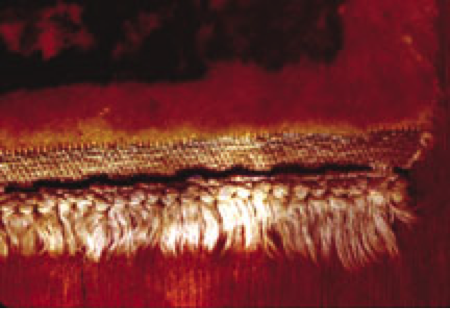 Damaged ends or fringes can be secured to stop further fraying by using a blanket stitch(Images 2 and 3). This will prevent further deterioration but will not always result in an aesthetically acceptable finish. It is, however, a simple and inexpensive way to stop further damage from occurring. Lay the rug face down with the end away from you. Work from left to right with a waxed thread of a color to match either the fringe or pile. Pass the thread through the kelim, or through the rug end if the kelim is missing, just under the first weft. Hold a loop of thread down with your left thumb and pass the second stitch in line with the first and through the top of the looped thread. Do not pull too tightly. Continue in this manner, spacing the stitches evenly between every four or five warp yarns. 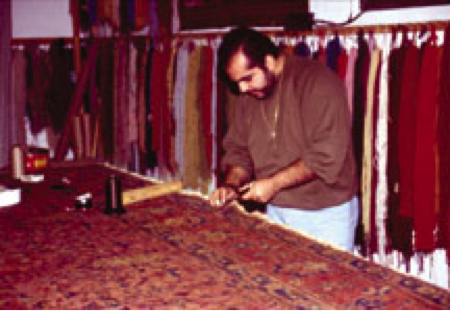 There are various methods available to repair the rug ends. It is important to decide, using common sense, on the most appropriate choice for your particular rug. The first priority is to preserve the rug’s value, so do not rush into a repair without careful consideration. When repairing fringes it is very important to test the strength of the existing warp yarns to see if they are weak or damaged. If you do not feel you have the skill to carry out the proper repair method, seek professional advice. No one wants to find they are responsible for a decline in a rug’s value. Weaving new warp yarns for missing fringes is quite difficult. As far as the value of the rug is concerned, this method of repair is certainly the best, but it does take a great deal of practice to become proficient at it. Attaching a machine-made fringe is the most common way this repair is done. It may not be suitable for a very valuable, collectable rug, but it should still be used when immediate attention is needed to prevent further deterioration. The most common circumstance encountered is one in which the owner does not have the budget, or is not willing to spend the funds, to weave new warp yarns. 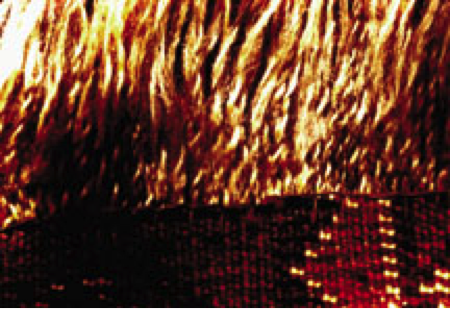 Select a fringe to match the original color (Image 4). If you find it necessary to dye one to get the right tone, choose a good quality fast dye and remember to buy sufficient length of fringe to allow for shrinkage in the dyeing process. Do not cut or remove any of the existing fringe, flat weave or kelim from the ends of the rug, as this will form a good, solid base on which to attach the new fringe. Never use adhesive or glue to attach the fringe to the rug; it will result in damage to the rug if the owner decides to remove the machine-made fringe at a later date and have the fringe replaced by weaving new warp yarns. Lay the rug on a flat surface with the fringe pointing towards you. Insert the kelim of the rug between the flaps of the machine-made fringe, ensuring that the face side of the new fringe is up. Leave 1/2 inch of the fringing to overlap the edge of the rug and allow the ends to be folded in to prevent fraying. This will make the completed job much neater. Pin the fringe into position on the face side only and make sure that none of the original fringe is showing through at the edge. With a double-waxed linen thread, sew the kelim edge of the machine fringe to the kelim of the rug with small, unobtrusive hemming stitches (Image 5). Do not show stitches on the front. Work from the right to the left and sew only the face side. Make sure the leading edge is perfectly straight, the kelim is not too loose and puckered and that the stitches are not spaced more than 1/2 inch apart. Secure the end by over-sewing the flap of machine-made fringe. This is a reasonably simple repair that can add a good profit to your cleaning business.